Hi, I am interested in your 2006 Chevrolet Corvette Coupe (stock #4672-ATL) listed on Autotrader for $29,995. I'd like to get more information about this vehicle and confirm its availability. Wearing a high impact, exceedingly rare color combo and sporting some great features by virtue of its special edition status, this 2006 Chevrolet Corvette Z51 is one sharp looking street machine. Its only logged a touch over 40,000 miles and has been treated with the utmost of care - owned and driven only by responsible adults and faithfully garage kept when not in use. The magnetic Sunset Orange paint draped over its sixth generation form catches your attention right off the bat. 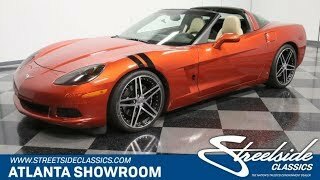 Its a very sharp color - far more distinctive than you normally see in a factory job and plenty rare as well, as only 7% of Corvette coupes left the factory during its model year decked out in this color scheme. Black accenting stripes crest the top of the drivers side fender and the smoked headlights up front add a custom touch to the overall appearance. Vettes of this era had awesome profiles, with their low-slung, street-hugging stance, sharply angled windshield and a pronounced rise to the rear fenders, giving the impression that this street machines rear wheels are ready to begin spinning with enough force to raise the rear end. The Targa top configuration is a great feature, affording the choice of either hardtop shelter or open-air motoring as you so choose. The close-set pair of dual tailpipes are another defining styling cue. Inside waits a great example of the inspired driving environments Corvettes became known for over the years. This interior is as clean as they come, with tan leather buckets and surrounding surfaces that show virtually no perceptible wear. Take a good look around and then take in a deep whiff and youll be firmly convinced no one has been permitted to eat or smoke in this car. A short throw shifter sits on the very clean center console, making runs through the gears a breeze. Comfort and convenience features include power seats, power door locks and windows, cruise control, air conditioning thats blowing as cold as you could want and an AM/FM/CD stereo that stands by to provide your driving soundtrack. Driver and passenger side air bags provide a welcome added measure of safety, while the anti-theft system helps ensure this fine-looking Chevy never leaves your possession unintended. Theres plenty of power on hand to go along with this Corvettes stunning good looks. A fuel-injected LS2 V8 resides in the very clean engine compartment and its a strong performer, good for a full 400 horsepower and 400 lb-ft of torque in factory trim. The 6-speed manual transmission its paired with puts maximum control of all that power in the hands of the driver and shifts with smoothness and precision. This Corvette was already very well-equipped when it left the factory, so its been kept in stock form, with the only aftermarket add-on being an upgraded Corsa exhaust that provides a great note out of those distinctive tailpipes in back. The upgraded, Z51 status comes with some great benefits, including a stiffer suspension, tires that offer better dry-road grip, larger brakes, and shorter ratios for the six-speed transmission, along with a transmission-oil cooler to ensure better performance in more challenging conditions. Precise power steering combines with the Corvettes wide track and low profile to make for outstanding handling and the 4-wheel power discs at the corners bring things to a stop in very short order. A set of very sharp C6 wheels - 19 in front and 20 in back - complete the look of this outstanding Chevy and are wrapped with Pirelli P Zero tires. This 2006 Chevrolet Corvette Z51 represents the model at a mechanical and aesthetic high point and its low mileage, rarely seen color and upper tier configuration put it in very select company. Call today!